We’ve just launched a new channel marketing program designed to help Sage partners leverage the knowledge they gain from Sage Fast Track coaching and turn new ideas into action. The Sage Fast Track program lays a great foundation of marketing knowledge and best practices. But once the coaching and curriculum is complete, many Sage Resellers have trouble finding the time and resources to implement what they’ve learned. Stuff like creating blog content, developing customer success stories, improving Google search visibility, and figuring out which social media tools and platforms are worthwhile and which are a tremendous waste of time. 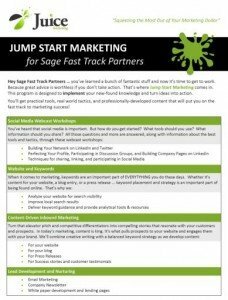 The Jump Start marketing program consists of tangible deliverables, content, and marketing pieces that help Sage partners turn new ideas gained in the Fast Track program into action. It covers a wide range of effective marketing tactics – both inbound and outbound – that will keep Sage partners top of mind with customers and prospects and ultimately drive more business. Because new ideas and strategy are great, but action is what makes it all work. Is Your Business Ready for a Jump Start? 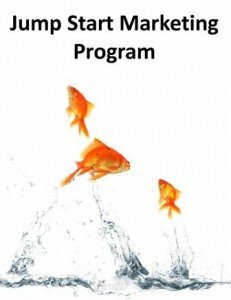 Get a copy of the Jump Start Marketing Brochure (PDF download) for pricing and program details.